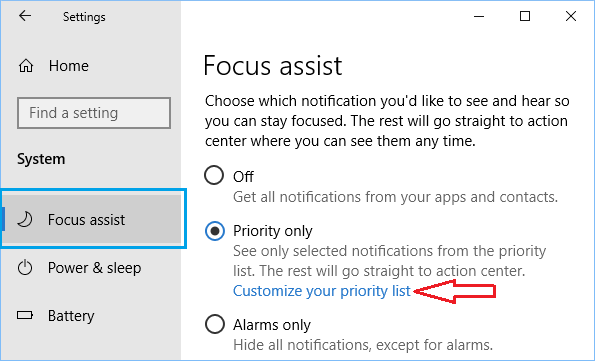 The Focus Assist feature in Windows 10 can help you stay distraction free by blocking notifications and alerts on your computer, during any set period of time. 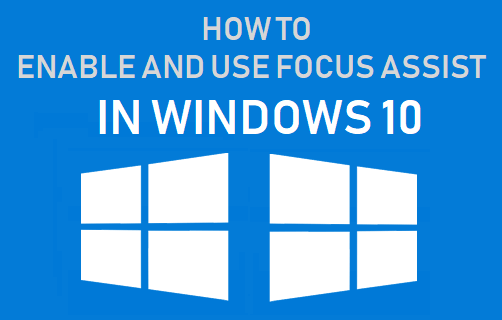 So, let us go ahead and take a look at how to enable and use Focus Assist in Windows 10. Most of us tend to get distracted by Social Media, Messages and Notifications on our computers and end up losing a good amount of productive time to these distractions during our work hours. One solution to this problem is to prevent such distractions from reaching you during work hours by making use of the Focus Assist feature as available in Windows 10. 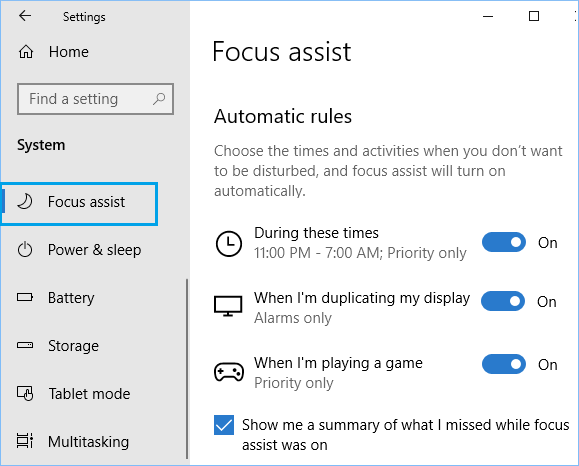 The Focus Assist feature as available on your computer is customizable and allows you to either block all distractions during a set period of time or allow notifications from family or certain Apps or Contacts during your busy period. As soon as the Focus Assist period is completed, you will be able to see a summary of Notifications and alerts that were received on your computer during the Focus period. 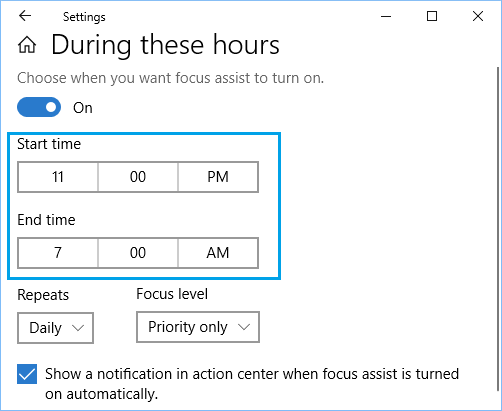 You can enable Focus Assist from the action center on your Windows computer or use Settings to enable, disable and configure Focus Assist period on your computer. 1. Open Settings and click on the System icon. 2. On the next screen, click on Focus Assist and select Priority Only option to enable Focus Assist on your computer. The other Focus Assist option that you can choose on this screen is Alarms Only, which disables All Notifications during Focus Assist period and allows only Alarms to reach you. Choosing OFF option, disables Focus Assist and you will see All Message and App Notifications on your computer. 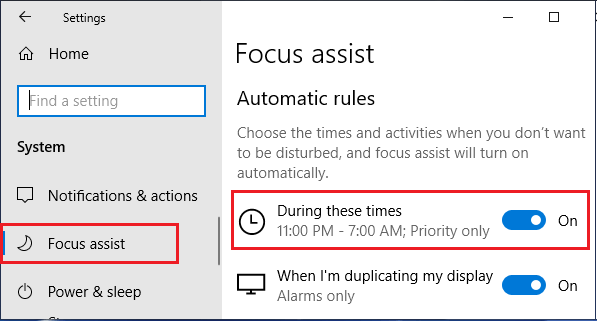 After enabling Focus Assist on your computer, the next step is to set up the time period during which you want the Focus Assist feature to kick in on your computer. 1. To setup Focus Assist period, open Settings and click on the System Icon. 2. On the System screen, click on Focus Assist > scroll down and click on During These Times option located under “Automatic Rules” section. 3. On the next screen, click on Start Time and set the Start Time for the Focus Assist period. Next, click on End Time and set the End time for the Focus Assist period. On the same screen, you can configure Repeats, Focus Level and choose whether or not you would like to see a Notification in the action center, whenever Focus Assist is automatically turned ON. 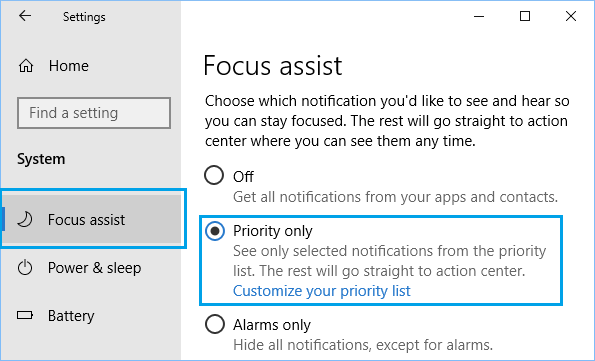 The Focus Assist feature in Windows 10 allows you to setup a priority list, in order to allow calls, notifications and alerts from certain Apps or people in your priority list. You will find below the steps to setup and configure each of the above options during Focus Assist period. 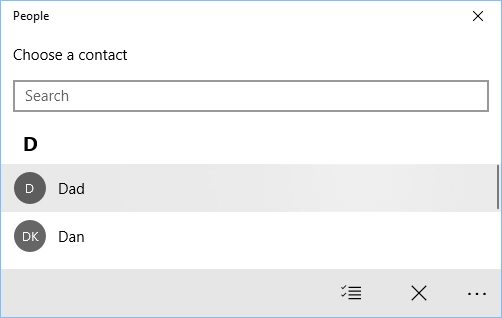 The Focus Assist feature in Windows 10 allows you to see on your computer whether someone called or sent a text message to your mobile phone, while you are busy working on your computer. To show notifications for missed calls, texts and messages received on your mobile device, go to the Focus Assist screen and click on the Customize your Priority List link. 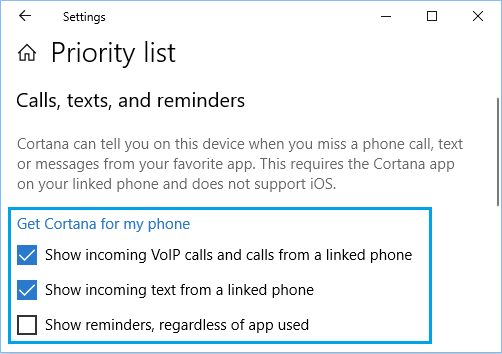 On the next screen, you will see the options to configure Cortana to show notifications for missed calls, texts and messages. 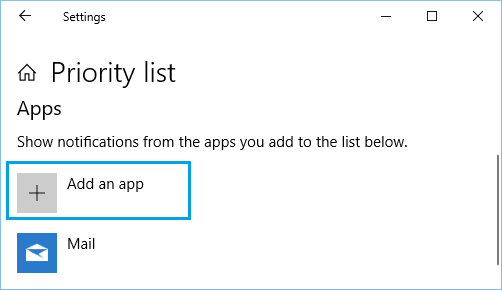 This option requires you to install the Cortana App on your mobile device and is not available for iOS devices. Another option available in Focus Assist is to allow notifications from your favourite Apps while you are busy working on your computer. For example, if you are expecting an important email, you can add the Mail App to the priority list and keep an eye on the emails being sent to your email account. To setup this option, go to the Focus Assist screen and click on the Customize your Priority List link. On the next screen, scroll down to the Apps section and click on Add an App button. On the next screen, click on the App that you want to add to the Focus Assist Priority List. You can avoid most distractions during Focus Assist period and still stay connected with your family and important people by adding people to the priority list. To Add people to Focus Assist Priority List, go to the Focus Assist screen and click on Customize your Priority List link. On the next screen, scroll down to People section and click on Add Contacts button. On the next screen, click on the Contacts or the People that you want to add to Focus Assist Priority List. 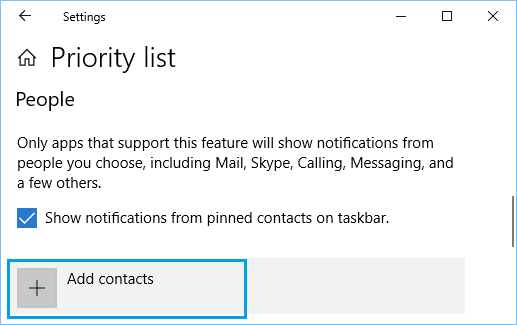 Once you add People to Priority List, only the Contacts having priority will be allowed to get through during the Focus Assist Period on your computer. Apart from allowing you to setup Focus Assist period, the Automatic Rules section of Focus Assist screen provides other options that you can see in the image below. When I’m duplicating my display: Selecting this option automatically enables Focus Assist on your computer, whenever you are mirroring the screen of your computer. This allows you to prevent notifications from popping up on the screen of your computer while you are giving a presentation by mirroring the screen of your computer using a projector. When I’m playing a game: Automatically turns ON Focus Assist, whenever you are playing games in full-screen mode. At the end, you will see the option to get a summary of what you missed during the Focus Assist period. You can get this summary by clicking on the Focus Assist Notification icon that you will see in the Notifications area of your computer.